Objectives To investigate the role of individual factors (including age, health and personal circumstances) and external factors associated with clients having a job start while engaging with the Work Programme and variations by benefit type. Setting The UK Government’s main return to work initiative (The Work Programme) in Scotland. Design Piecewise Poisson regression to calculate incident rate ratios using administrative data from 2013 to 2016 to identify factors associated with job start. Participants 4322 Employment and Support Allowance (ESA) clients not in work due to poor health and 8996 Jobseeker’s Allowance (JSA) clients, aged 18–64 years, referred to the Work Programme between April 2013 and July 2014. Main outcome measures Starting a job and the time to first job start after entering the Work Programme. Results JSA clients (62%) were more likely to return to work (RTW) than ESA clients (20%). There is a strong negative relationship between age and the predicted probability of having a job start during the 2-year engagement with the programme for both JSA and ESA clients. JSA clients were most likely to RTW in the first 3 months, while for ESA clients the predicted probability of having a first job start was fairly constant over the 2 years. Health, including the number of health conditions, length of unemployment, client perception of job start and other individual factors were associated with job starts for both groups. Conclusions Age plays an important role in influencing RTW; however, important potentially modifiable factors include the length of unemployment, the management of multimorbidity and the individual’s perception of the likelihood of job start. Future welfare-to-work programmes may be improved by providing age-specific interventions which focus on health and biopsychosocial factors to enable more people to realise the potential health benefits of RTW. This is the first study to explore the role of individual age, health and other factors in returning to work, using large-scale administrative data collected over a client’s 2 years participation in the Work Programme. The use of administrative data (rather than survey data as in previous evaluations) limited loss in follow-up; however, the analysis relies on routine operational data with limited health diagnostic and severity information available. Jobseeker’s Allowance (JSA) and Employment Support Allowance (ESA) clients were analysed separately showing important differences in return to work between the two client groups (by definition those with and without an illness, health condition or disability that makes it difficult to work, although many JSA clients disclosed health conditions). The number of (self-disclosed) health conditions for JSA and ESA provides new insights. This study had modelled age as a continuous variable (1406 JSA clients and 1322 ESA clients aged 50 years and over) to better understand the relationship between age and RTW rather than the single age category (50+ years) of other studies. Labour market participation is an important determinant of health and health inequalities, with efforts to increase paid employment thought by policymakers to improve health.1–5 However, health status also inhibits returning to work from being unemployed, especially for those with multiple health problems.6–9 In addition, age is closely connected to both health status and other difficulties in returning to work, with employment rates for the working age population declining sharply from over 80% of those aged 50 years in the UK, to around 60% of those aged 60 years with a steeper decline at older ages.10 This paper uses a unique database to analyse the likelihood of unemployed people on the government’s Work Programme (WP) returning to work. Specifically it considers the role of age when comparing those with an illness, health condition or disability that makes it difficult to work (those receiving the Employment and Support Allowance (ESA)) and others on the programme (those receiving Jobseeker’s Allowance (JSA)). The WP was launched throughout Great Britain in June 2011 as part of a sweeping programme of welfare reforms with final referrals in March 2017.31 It required more people to either seek work or to undertake some form of work-related activity as a condition of receiving benefit.32 The 2-year programme was delivered by a range of private, public and voluntary sector organisations across 18 regions. The Department for Work and Pensions (DWP) paid two or more prime contractors to provide directly or indirectly (through subcontractors) support to unemployed job seekers in each region (delivered as a ‘black box’ approach where much of the control over services provided was wielded by the contractor). One innovatory feature was that payments were by results with most payments being after a participant had sustained employment (although not necessary with the same employer) for a minimum time, rather than payments being mainly for job seekers participating or entering employment. The unemployed including those out of work due to health reasons were required to participate in the WP, and others were able to volunteer to use the services depending on their circumstances. The WP supported two main groups of benefit claimants: JSA clients and ESA clients. JSA is a benefit for people who are unemployed but capable of work, usually paid to unemployed people if all of the following apply: they are aged 18 years to state pension age, not in full-time education, living in Great Britain, available for work, actively seeking work and work on average <16 hours per week.33 Those aged 18–24 years were a priority group and had to have been unemployed a shorter period (usually 6 months) before entering the WP than most older groups. ESA is a benefit for people who have an illness, health condition or disability that makes it difficult to work and requires participants to undergo a Work Capability Assessment.34 Claimants may get ESA if their illness or disability affects their ability to work and if they are: under state pension age, not getting statutory sick pay or statutory maternity pay and have not gone back to work and are not getting JSA. ESA clients are not separated by age and often people become disabled or experience worsening health, and so join ESA, later in life. So generally ESA clients in our study are older than JSA clients. What is the relationship between age and returning to work for JSA and ESA clients engaged with the WP? How does the likelihood of returning to work change over the period of their participation in the WP for JSA and ESA clients? What other factors, including health, are associated with RTW for JSA and ESA clients? ‘Supporting Older People into Employment’ (SOPIE) is a mixed methods longitudinal study involving a collaboration between academics, a major WP provider (Ingeus) and the UK DWP. Full details on the study, including sample size, can be found in the protocol paper.39 The study population was all clients who entered the Ingeus WP in Scotland between 1 April 2013 and 31 July 2014 (14 265 clients). After data cleaning the SOPIE cohort totalled 13 318 clients. The 947 clients were removed from the study population as they had significant missing baseline data including age (n=693); it was not possible to generate datazone from postcode (n=100); were aged 16–17 years (n=7); had lengths of unemployment which were not possible, for example, a client aged 20 years with 10 years of unemployment history (n=147). The cohort was followed up longitudinally for the 2 years they engaged with Ingeus on the WP. After referral to the WP, clients completed a baseline face-to-face assessment with an employment advisor. The individual factors collected in the baseline assessment and used in this study were: age, gender, length of unemployment prior to the WP, highest qualification, ethnicity, whether the client had health concerns which they believed would affect their ability to work, number of health conditions disclosed to advisor, client perception of their likelihood of starting a job and personal circumstances (caring responsibility other than children, housing status, parental status). Ethnicity was recoded as white British and all other due to sample size. The number of health conditions disclosed by clients were categorised into 0, 1, 2 and 3 or more for JSA clients and 0/1, 2, 3, 4 and 5 or more for ESA clients. As expected, ESA clients disclosed a greater number of health conditions. One hundred twenty-one (2.8%) ESA clients disclosed no health conditions. This may have been a coding error or the client may have decided not to disclose their health condition to their advisor; hence, we coded 0 and 1 disclosed health conditions together (table 1). The primary outcome measures were the client starting a job and the length of time from beginning the WP to their first job start (months). Univariate and multivariable Poisson regression analyses were used to calculate incident rate ratios (IRR) and 95% CIs to examine the associations between job start (RTW) and individual, personal and external factors. The unadjusted models contained age and gender and the adjusted models contained all the variables in the study. Overall differences between the categories are reported and for ordered variables (length of unemployment, highest qualification, number of health conditions disclosed to advisor, SIMD quintiles), a linear trend across categories was also determined. Predicted probabilities of RTW were estimated using postestimation commands following regression modelling, with illustrative results shown for people aged 25 and 50 years when appropriate. All analyses were carried out using Stata V.14. No patients/clients were involved in developing the hypothesis, the specific aims or the research questions, nor were they involved in developing plans for design or implementation of the study. No clients were involved in the interpretation of study results or write up of the manuscript. Clients did provide feedback on emerging findings at yearly stakeholder meetings and a final study symposium. Of the SOPIE cohort of 13 318 clients, 8996 (68%) were claiming JSA and 4322 (32%) were claiming ESA. Table 1 shows the descriptive statistics of the cohort by benefit type for all variables included in the study. As expected, due to welfare benefit rules, more ESA clients were aged 50 years and over (ESA clients 31%; JSA clients 16%). There were statistically significant differences (p<0.001) between the two client groups across all variables, except for the test of association between SIMD quintiles (p<0.05). The table also shows jobs starts for each variable, with 5612 JSA clients (62%) and 867 ESA clients (20%) having at least one job start during the 2-year programme. Figure 1 shows how the predicted probability of JSA and ESA clients having a job start at any point during the 2-year WP varies according to baseline age and gender. There is a strong negative relationship between age and having a job start for both JSA and ESA clients. Male JSA clients have a higher probability of job start compared with female JSA clients at all ages. However, there is no difference in the probability of a job start for male and female ESA clients. Predicted probability of JSA and ESA clients having a job start by age during the 2-year Work Programme. ESA, Employment and Support Allowance; JSA, Jobseeker’s Allowance. Figures 2 and 3 show the predicted probability of job start for all four 3-month periods in year 1 of the WP, and the average for all 3-month periods in the whole of year 2 of the WP, for the female and male JSA and ESA clients aged 25 and 50 years (Figures 2 and 3, respectively). Step graph showing predicted probability of female and male JSA clients aged 25 and 50 years having a job start in a 3-month period. JSA, Jobseeker’s Allowance. 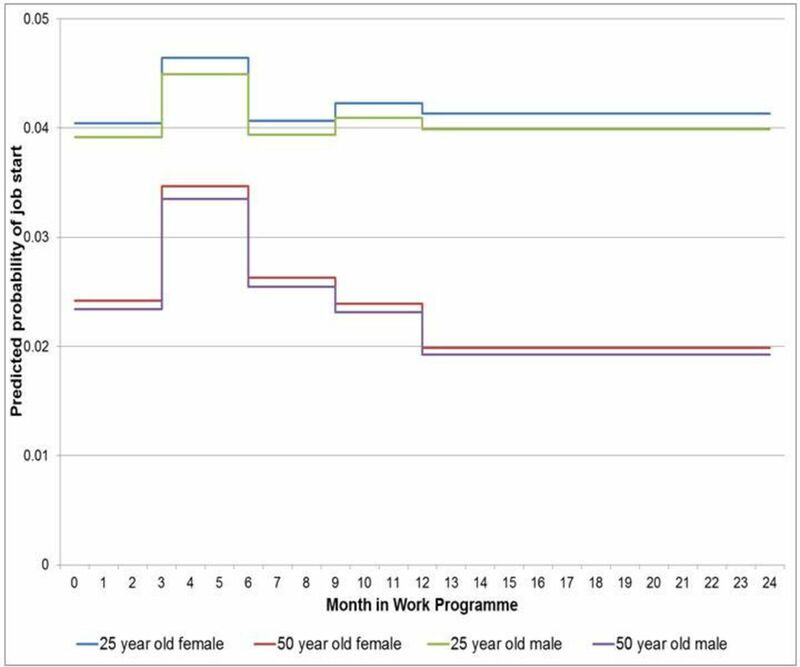 Step graph showing predicted probability of female and male ESA clients aged 25 and 50 years having a job start in a 3-month period. ESA, Employment and Support Allowance. There are marked differences both by age and benefit type when clients are more likely to have a job start throughout the 2-year programme. Younger JSA clients have the highest predicted probability of job start in the first 3 months of their participation in the programme (females 23%, males 28%), which falls off every 3 months through the programme to 9.6% for females and 11.7% for males in an average 3-month period in year 2 of the programme. 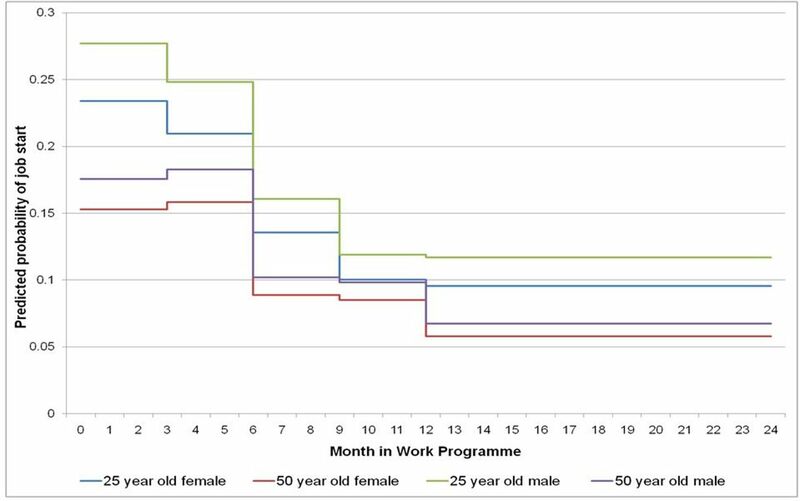 Older JSA clients have a similar probability of a job start by gender in the first 6 months of the programme (female 15%, male 18%), which decreases to 5.8% and 6.8% for females and males respectively in an average 3-month period in year 2 (figure 2). ESA clients, with more health conditions, have a much lower probability of job start compared with JSA clients, particularly in the first 3 months of the programme (ESA clients aged 25 years 4%, 50 years 2.4%). Apart from a small increase (<1%) between 4 to 6 months the probability of a job start remains largely unchanged for ESA clients aged 25 and 50 years for the remainder of the programme, with the younger clients having a higher probability (figure 3). Unadjusted and multivariable adjusted IRR for factors associated with having a job start for JSA clients are shown in table 2. Unadjusted analyses showed that female JSA clients were 16% less likely than male JSA clients to have a job start but this association was entirely attenuated when adjusting for all other factors. The length of unemployment before joining the WP was a strong predictor of job start. Clients having educational qualifications under five General Certificate of Secondary Education (GCSEs, or equivalent) or below GSCE level were 17% and 23%, respectively less likely to have a job start compared with those with a degree or higher. Unadjusted analyses showed that compared with white British clients, other clients were 12% more likely to have a job start (but when adjusted this association was not significant). In terms of clients’ health, disclosing one health condition was associated with a 12% decrease, two health conditions a 24% decrease and three or more health conditions a 45% decrease in the likelihood of having a job start compared with disclosing no health conditions. Having health concerns which the client believed would affect their ability to work versus having no health concerns, was associated with a 36% decrease in the likelihood of having a job start. Client perception of job start was a strong predictor of job start. In terms of personal circumstances having caring responsibilities for anyone other than children and living in insecure housing (which included temporary housing and homelessness) were associated with a decreased likelihood of job start. Although unadjusted analyses showed significant associations with parental status, when adjusted all associations were lost. In terms of external factors, JSA clients living in SIMD quintile 1 were less likely to have a job start, and those living in large urban areas were more likely to have a job start; however, the associations were lost in the adjusted model. Unadjusted and multivariable adjusted IRR for factors associated with having a job start for ESA clients are shown in table 3. Females were as likely as male clients to have a job start. Increasing length of unemployment was significantly associated with a lower probability of having a job start. While there was a relationship between education and RTW in the unadjusted model, this disappeared in the fully adjusted model. Non-white British clients were less likely to have a job start. For ESA clients, disclosing health conditions was associated with a 16% decrease (two health conditions), 32% decrease (three health conditions), 51% decrease (four health conditions) and 49% decrease (five or more health conditions) in the likelihood of having a job start compared with disclosing zero or one health conditions. Having health concerns which the client believed would affect their ability to work versus having no health concerns, was associated with a 32% decrease in the likelihood of having a job start. Clients’ perceptions of job start were a strong predictor of job start. Compared with those clients who thought they would start work within 1 month, clients who thought they would start work in >4 months were significantly associated with a reduction in job start in the adjusted model. In terms of personal circumstances, only parental status was significantly associated with job start, and those with no children less likely to have a job start. In the unadjusted model, those clients living in quintiles 2–5 were more likely to have a job start than clients living in quintile 1 (most deprived), but this association was lost after adjustment in the full model. ESA clients living in small towns and accessible rural areas were more likely to have a job start than those living in large urban areas; however, the effect was lost in the full model. This study sought to investigate the role of age, health and other factors associated with RTW among two client groups engaging with the 2-year WP. 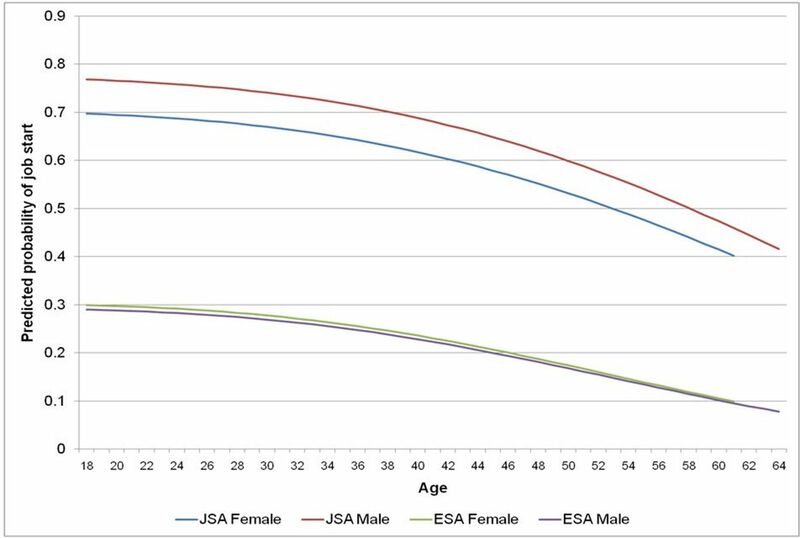 There is a strong continuous negative relationship between age and having a job start for both JSA and ESA clients, with no clear evidence for a specific age at which RTW becomes much less likely. For all JSA clients, the probability of a job start is highest in the first 3 months from joining the programme, decreasing progressively throughout rest of the programme. For ESA clients, the probability of a job start changes little throughout the WP. We further identified a range of factors which were associated with JSA and ESA clients having a job start, including some that have not been explored in previous RTW programmes. Our findings reveal some benefit type similarities as well as some interesting differences with the literature. Reducing the disability employment gap and enabling more older people to work for longer are key policy challenges.12 35 This study is therefore particularly important as it extends our understanding of the factors, including age and health as well as certain socioeconomic factors, which are associated with RTW and by investigating the JSA and ESA clients separately we have detected further differences which other studies were not able to discern.8 37 The unique and rich SOPIE cohort also benefits from a 2-year follow-up on all clients. While several studies have reviewed RTW in welfare-to-work initiatives, these have been limited in several ways, for example, they examine fewer explanatory variables and discrete age categories.8 45 46 Thus, the size of the SOPIE cohort and the range of the variables collected are considerable strengths. While the availability of such rich data on RTW is a major strength of this study, there are also some limitations to the data. The research team only had access to the variables routinely collected and could not specify the data collection. Apart from the employment outcomes, the baseline data were generally collected when a client was first referred to the programme and data on external factors such as job opportunities is limited. While this study is limited to clients in Scotland, the results are generalisable to the rest of the UK. Research question 3 asked what other factors are associated with RTW for JSA and ESA clients. In addition to age, the factors we investigated were drawn from a broad framework of employability covering three main interrelated components, or sets of factors, which influence a person’s employability: individual factors, personal circumstances and external factors.54 55 Although previous studies have shown gender differences in the likelihood of RTW,8 45–47 56 the gender difference that was observed for JSA clients is lost when all other factors were included in the adjusted model. Those with poorer employment records (especially longer periods of unemployment) on entering the WP were less likely to have a job start and this confirms much prior evidence of having recent work experience prior to claim/entry to programme for RTW.8 45 46 Our results further confirm earlier evidence that higher qualifications are important in influencing RTW,46 49 but interestingly not for ESA clients. While there was a relationship between educational qualifications and RTW in the unadjusted model, this disappeared in the fully adjusted model. Further investigation showed this to be due to the relationship between RTW and both length of unemployment and the client’s perception of when they saw themselves starting a new job. Ethnicity was important for ESA clients (at the 5% significance level, although not significant for JSA clients), suggesting clients other than white British may require more appropriate support. In terms of external factors, as with a WP evaluation,8 the unadjusted results show that areas of greatest deprivation were associated with lower RTW, but this association was lost in the full models for both client groups. In the unadjusted models, those JSA clients living in areas other than large urban areas were less likely to have a job start whereas ESA clients living in small towns and accessible rural areas were more likely to have a job start; however, these effects disappeared after adjusting for other factors. It is widely recognised that being employed can improve a person’s health and well-being and help reduce health inequalities.2 5 The key findings of this study have important implications for policy makers. While the disability employment gap has been recognised in Government policy,36 there is little evidence that current programmes will reduce barriers to the employment of ageing workers. While they will provide specialised support for those unemployed for over 2 years, our findings would suggest much earlier intervention is needed. This is also supported by evidence that the longer an individual is absent from work, the less likely it is that they will return, and early intervention for those off work sick has been shown to be effective.65 66 Programmes for those with health conditions or disabilities are likely to be voluntary, but therefore may not engage individuals who, because of their unemployment, are more likely to have low mood, have an inappropriately pessimistic outlook, be socially isolated and reluctant to access support which needs to be based on the biopsychosocial model.67 68 Perceptions about ability to work are important, but these may have been influenced by health professionals or other advisors with little knowledge of occupational health, workplaces or access to vocational rehabilitation expertise.65 This study clearly shows that for the individual there is an inverse relationship between job start and the number of health conditions highlighting the need for healthcare providers to include vocational rehabilitation as part of treatment pathways.69 Linked to improving workability are education and retraining of ageing workers with medical conditions who may be unfit for their usual role and be disadvantaged because of poor IT or other skills.15 At present in the UK, much of the educational focus has been on the young unemployed,70 and new programmes need to include training to update and develop new skills for older workers. While it is generally accepted that most work is beneficial to health,5 the potential health impacts of engaging with the WP requires further evaluation and linkage of this cohort to National Health Service Scotland Information Services Division health data is planned. More nuanced estimates of contextual factors such as personal circumstances (including the influence of others in the household) and external factors (such as types of local labour demand, employer behaviours and transport provision) would be useful in refining their influence and importance. Future research also needs to evaluate the long-term vocational outcomes of RTW programmes and whether expected health benefits of RTW are realised by these programmes, particularly when distinguishing the types of jobs people enter and the possible increase in job precariousness and insecurity. Age, health and a variety of socioeconomic factors play an important role in influencing RTW for unemployed people and for people who have an illness, health condition or disability that makes it difficult to RTW. Other countries with similar types of programmes, supporting both disabled and other job seekers, may also find similar relationships between individual characteristics and personal circumstances of participants. The results from this study will help inform interventions focussing on addressing age-specific, health and biopsychosocial barriers for future RTW programmes with the aim of improving employment outcomes, so that individuals, society, employers and the wider economy can benefit from extending working lives. The authors would like to acknowledge the help of Paul de Pellette, Luke Jeavons, Cem Zobu at Ingeus, Oarabile Molaodi, Daniel Mackay at the University of Glasgow and the DWP.
. Working for a healthier tomorrow: dame Carol Black’s review of the health of Britain’s working age population. London 2008.
. Is work good for your health and wellbeing? London: The Stationery Office, 2006.
. Work programme evaluation: the participant experience report. London, 2014.
. A New Vision for Older Workers: Retain, Retrain, Recruit. London: Department for Work and Pensions, 2015.
. Literature review on employability, inclusion and ICT, Report 1: the concept of employability, with a specific focus on young people, older workers and migrants. Luxembourg, 2013. Department for Work and Pensions. Fuller Working Lives Evidence Base - 2017. 2017.
. Future of an ageing population. London, 2016.
. Labour market transitions among the over-50s. London: Department for Work & Pensions, 2005.
. The economically inactive who look after the family or home. Labour Market Trends 2002;110:577–87.
. Understanding workless people and communities: a literature review. London: Department for Work and Pensions, 2005.
. Decentralisation and Coordination: the twin challenges of labour market policy: Organisation for Economic Cooperation and Development, 2008. OECD. Activating Jobseekers: how Australia does it: Organisation for Economic Cooperation and Development, 2012.
. The design of the Work Programme in international context, report for the National Audit Office. London, 2011.
. Incapacity benefits - change and continuity in the Swedish welfare state. In: Lindsay C , Houston D , eds. Disability benefits, welfare reform and employment policy. Basingstoke: Palgrave Macmillan, 2013:178–98.
. From Dutch disease to Dutch Fitness? Two decades of disability crisis in the Netherlands. In: Lindsay C , Houston D , eds. Disability benefits, welfare reform and employment policy. Basingstoke: Palgrave Macmillan, 2013:199–215. Department for Work and Pensions. The Work Programme. 2012.
. The Work Programme: National Audit Office, 2014. Department for Work and Pensions, Department of Health. Improving lives: the work, health and disability green paper. 2016. Department for Work and Pensions, Department for Health. Improving lives: the future of work, health and disability. 2017.
. Employment support for unemployed older people. 2014.
. Helping 50+ jobseekers back to work:lessons for the Work and Health Programme. 2016. Department of Health. Long term conditions compendium of information. 3rd edn: Department of Health, 2012.
. Working for families evaluation. Edinburgh: Scottish Government, 2009.
. Health at work - an independent review of sickness absence. Secondary Health at work - an independent review of sickness absence 2011. 2011. Health Works. A review of the Scottish Government’s Healthy working lives strategy: secondary health works 2013. 2013. Contributors EBM, JB, SVK, AHL, RWM and JF had the original idea and developed the overall research design. JB conducted the statistical analysis with significant advice from SVK, AHL, RWM and JF. JB wrote the first draft. All authors subsequently contributed and commented to the manuscript and approved the final version. Funding This project (and researcher JB) is funded by the MRC as part of MRC LLHW Extending Working Lives Partnership Awards (MR/L006367/1). AHL and SVK are funded by the MRC (MC_UU_12017/13 and MC_UU_12017/15) and the Scottish Government Chief Scientist Office (SPHSU13 and SPHSU15). SVK is supported by a Fellowship from the Scottish Government Chief Scientist Office (SCAF/15/02). JF is funded by the MRC (MR/K023209/1) and Scottish Government Chief Scientist Office (SCPHRP), as well as the Usher Institute of Population Health Sciences and Informatics at the University of Edinburgh. Ethics approval Ethical approval for this project was received from the University of Glasgow College of Social Sciences Research Ethics Committee (400140186). Data sharing statement Ingeus acts as data processor on behalf of the data controller, the DWP. Ingeus is able to share data with the University of Glasgow (UoG) as detailed in the MRC Collaboration Agreement and the Research Data Licence between UoG and DWP.